The Charles R. Walgreen, Jr. 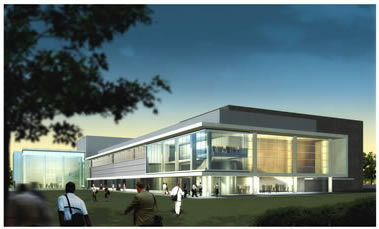 Drama Center will provide an important destination venue for North Campus, and will be located along a major pedestrian connection between the School of Music and the central core of North Campus. The Charles R. Walgreen, Jr. Drama Center will house the Arthur Miller Theatre, designed as a flexible courtyard theatre capable of being configured either as thrust or end stage, with a seating capacity of approximately 250 persons. It will also house the Theatre and Drama Department of the School of Music, currently located in the Frieze Building, providing classrooms, rehearsal spaces, a scene shop, faculty offices, and support space for Theatre and Drama. The Charles R. Walgreen, Jr. Drama Center project will be 97,500 gross square feet on two floors, with a partial basement and penthouse for mechanical equipment. The Stamps Auditorium, an addition that will complete the Walgreen Drama Center project, will be a 450 seat multi-purpose facility, serving both the School of Music’s need for a performance space with great natural acoustics and the broader campus desire for premier multi-media lecture space. The hall is designed to provide very low levels of background noise, flexible acoustic elements to permit tuning of sound absorption and reverberation, performance audio systems, a video projection system, wireless networking, and tablet arm chairs as well as power receptacles for laptop users at most seating locations. Situated along the west side of the North Campus Quad, Stamps Auditorium will create a strong architectural gesture that marks the southwest gateway into this central space of the North Campus and will begin to articulate the west edge of the quadrangle. Sheathed in a glass skin, the multi-storey lobby spaces that front onto the Quad will present a luminous and captivating environment to pedestrians. Within, the auditorium’s robust and powerful architecture of concrete, wood, and velour acoustic elements will create a memorable space for important lectures, music recitals, multi-media presentations, and symposia.